This red and white crochet wreath is adorned in candy canes and looks perfectly sweet for the holiday season. This soft and plush wreath is great for indoors or out and is a fun way to celebrate the sweetness of Christmas. This is a great pattern for amigurumi fans and would be a great project for a beginner crocheter who's looking for a bit of a challenge. You could also add some glittered gum drops or sugar plums to create a wreath that's sweet and satisfying! Carry dropped yarn behind sts as you work. With White and H hook ch-4, sl st to form a ring. Insert a chenille stem that has been folded in half and twisted slightly to hold tog. Fasten off Red, pick up White, hdc dec next 2 sts until opening is closed, fasten off. Continue until you have 13 candy canes. Reverse color and make 5 candy canes. ROW 2: Hdc next 3 sts, drop Red, pick up White, hdc last 3 sts, ch-1, turn. ROW 3: Hdc next 3 sts, drop White, pick up Red, hdc last 3 sts, ch-1, turn. Rep row 2-3 until piece measures 137” long, fasten off. Using the U shaped florist pins, pin one end of ribbon to wreath, carefully wrap the wreath with the ribbon being careful not to overlap the edges, fasten with another U pin. 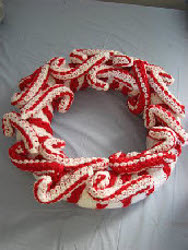 Carefully arrange the candy canes onto the wreath holding them in place with the U pins. My daughter saw this and said, "Please, Mom!" So, it looks like I'll be making one for her very soon. It is an unusual wreath but I like that! @yarncrazy So glad you like it! It is a different style wreath, but I love that, too! This is a pretty neat wreath. I like it because it is not very traditional and doesn't include fake trees(lol). One thing that would make it better was if at had a little extra decoration at the bottom. You know, like a Merry Christmas or something. Great idea, @craftfanatic! I think a simple "Merry Christmas" sign would look great on this wreath.